Odžaci (Serbian Cyrillic: Оџаци) is a town and municipality in the West Bačka District of Serbia. It is situated in the Autonomous Province of Vojvodina. The town of Odžaci has a population of 8,795 people, while the population of the municipality of Odžaci is 30,196 people (2011 census). The name Odžaci / Оџаци means "chimneys" in Serbian. Formerly, the settlement was also known as Odžak / Оџак ("chimney"). The Slavic/Serbian word "odžak" (or plural "odžaci") is a modification of the Turkish word "Ocak" (bearing the same pronunciation), meaning "fireplace". In Croatian, the town is also known as Odžaci, in Hungarian as Hódság, and in German as Hodschag. The old Hungarian name of the settlement was "Kéménd", first mentioned in 1522, and meaning "with chimney". Derived from the aforementioned Serbian word "Odžak" was the new Hungarian name "Hódság" (also later called "Hódsági Járás" (Hódsági district)), as well as the German name "Hodschag". While there is speculation about a village named Odos or Hodos being mentioned by Catholic records as early as the 14th century, the first reliable mention of the Hungarian village of Kéménd was in 1522. This village was destroyed during the Ottoman invasion, and the Ottomans founded a new village on the nearby location. This village is mentioned in the Ottoman defters in 1557 under the name Ucsak. It was part of the nahiya of Bač. The 1579 Ottoman defter mentions a village named Tatar Ocak with 28 Serbian and also some Muslim families. In 1610, the village of Ocsak is mentioned as part of the sanjak of Szeged. However, due to heavy taxation, the population of the village fled to the north and east. Starting in 1687, the village was under Habsburg administration, and in 1690 it was populated with new Serbian settlers. During the Hungarian uprising of Ferenc II. Rákóczi (1703–1711), the village of Ocsak was destroyed. Ocsak is mentioned again in 1728, while in 1733 it was populated with 100 Serbian and Šokac families, but they were soon resettled. With the pretext that Serbs do not pay taxes, the empress Maria Theresa decided in 1755 to resettle those Serbs from this territory and to populate Ocsak with Germans. The first group of Germans came a year later from the Schwarzwald. About 300 German families were brought into the area. Some Hungarians also settled here in 1752. By 1767, the villagers had erected a Roman Catholic church. 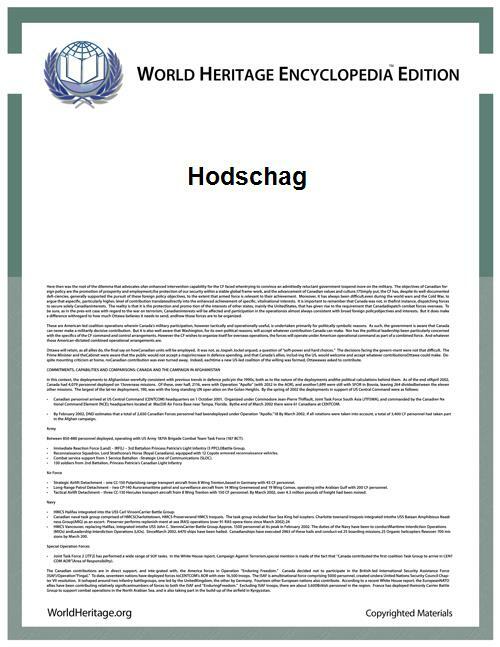 At times Germans spelled the village's name "Hocsak", but it soon became and remained "Hodschag", as a variant of the Hungarian "Hódság". By 1813, it was a "field town", giving it the right to grant citizenship to settlers (who continued to come), as well engage in fairs and other economic activity. As in some other parts of the Vojvodina, its economy was based on hemp, the rope derived from it being very important in agricultural applications of the day, and became fairly well-developed, enlarging its church, and having a post office, telegram access, and a train station. The 1813 National Census records that the village consisted of 4,344 inhabitants, in 704 houses, of whom 3,798 gave their language as German, 460 as Hungarian, 45 as Slovakian, and 29 Serbian, and of whom 4,224 gave their religion as Roman Catholicism, 37 as Calvinism, 34 as Lutheranism, 32 as Greek Orthodoxy, and 8 as Judaism. During the interbellum period, Odžaci was part of the Kingdom of Yugoslavia. The first football club in Odžaci was founded in 1919, and in 1920, the beer factory also began operating. During the Axis invasion, the Jews of Odžaci left, or were transported to face a grim fate in concentration camps. Since the end of World War II, a peace has returned to the town, but the demography is much changed. The economy and the architecture have also modernized, reflecting the typical modern but not especially dynamic nature of mid-size towns of the Socialist Federal Republic of Yugoslavia. In 1994, a group of former German residents sponsored the reconstruction of the destroyed Catholic cemetery and its chapel, and erected a memorial inside the chapel with the names of 955 residents murdered either in Odžaci or in other camps in Yugoslavia. Note: For the village with Hungarian ethnic majority, the name is also given in Hungarian. Settlements with Serb ethnic majority are: Odžaci, Bački Brestovac, Bački Gračac, Deronje, Karavukovo, Ratkovo, and Srpski Miletić. The settlement with Hungarian ethnic majority is Bogojevo. Ethnically mixed settlement with relative Slovak majority is Lalić. There is a textile industry, chemical industry, agricultural machine industry in this town. Odžaci is connected to other cities in Serbia like Novi Sad and Belgrade by the local coach carrier Saobraćaj Odžaci. The annual International Multimedial Art Festival (IMAF) is held in Odžaci since 1998. Web site of J.P. "Direkcija za izgradnju"
Commons has media related to Odžaci.